Split is a relatively easy city to get around for sightseeing, especially as many of the top sights (as listed below) are within easy walking distance of each other, mostly in or nearby the Diocletian’s Palace area. If you’re interested in an organised tour, then renowned tour company Viator have several options for you. These include the Diocletian Palace Walking Tour and Optional Trip to Trogir (which is a delight! ), that lasts 2-5 hours. If you’re visiting Split from a cruise ship, then you might also be interested in the Split Shore Excursion: Diocletian Palace Walking Tour (90 minutes) or the longer Split Shore Excursion: Diocletian Palace Trogir Tour (3 hours). If you’re less keen on sightseeing but are into something a little more active, what about the Split Shore Excursion: Cetina River White-Water Rafting Adventure (7 hours). 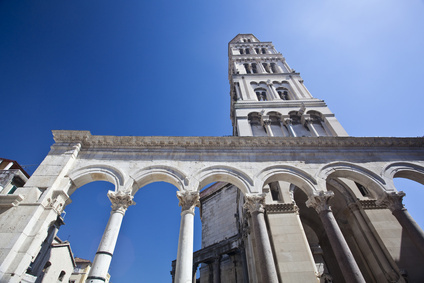 The Diocletian’s Palace complex is obviously the most important sight in Split. Get a locally published guide in English which describes this monument in great detail to fully take in all its nooks and crannies. Do not miss the Peristyle (peristil in Croatian) which is the main open space in the palace and is surrounded by a colonnade of six columns to the eastern and western sides and an arch, decorated with garlands, in the centre. As you walk through the whole area, pay special attention to the mix of old and new, and marvel at how the locals have managed to evolve and live within the Palace footprint in the many centuries since the Palace was constructed. The Cathedral of St Domnius (Katedrala Sveti Duje) is on the eastern side of the Peristyle. Originally built – at the same time as the palace – as a mausoleum for Emperor Diocletion (who died in 313 AD), his remains vanished a few centuries later. In the 7th century, those who had fled to nearby Salona (Solin) after it was attacked turned the mausoleum into a cathedral – and placed in it the bones of their Bishop, Domnius, whose execution had been ordered by Diocletian himself. The belltower of the Cathedral is well worth climbing for gorgeous views over Split, both out to sea and inland. Admittedly, the staircase up the centre of the tower does have a bit of a rickety feel to it, so this activity is perhaps not best advised for people with a fear of heights! Those that brave it will be well rewarded at the top. On the western side of the Palace is the People’s Square (Narodni trg) on which is the old town hall which was built in the 15th century. The town hall houses an ethnographic museum (worth visiting) which was established in 1910. Nearby is the Split City Museum. Gregory of Nin/Grgur Ninski – his gold foot is just visible! 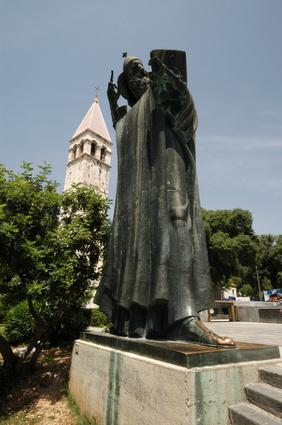 The remarkable statue of Gregory of Nin (Grgur Ninski) – by famous Croatian sculptor Ivan Mestrovic – is one of the most visited sights in Split. Grgur Ninski was a Croatian religious leader from the 10th century. The big toe on the statue’s left foot is shiny gold, having been rubbed by many people over the years – rubbing it is said to bring good luck. The Mestrovic Gallery is housed in a villa that was completed in 1939, and designed by Ivan Mestrovic himself, to use as his summer residence. The Mestrovic Gallery was opened in 1952 and houses over 200 of Mestrovic’s works. Museums in Split include the Maritime Museum; the Museum of Croatian Archaeological Monuments; and the Museum of Croatia.